1.30 Year Treasury Spike….Someone Made $60 Million on the Trade. 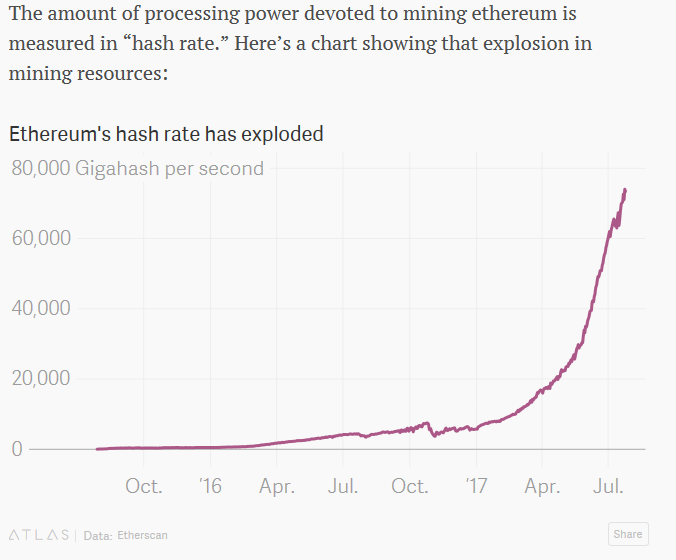 But at least one large position amassed last week looks prescient. 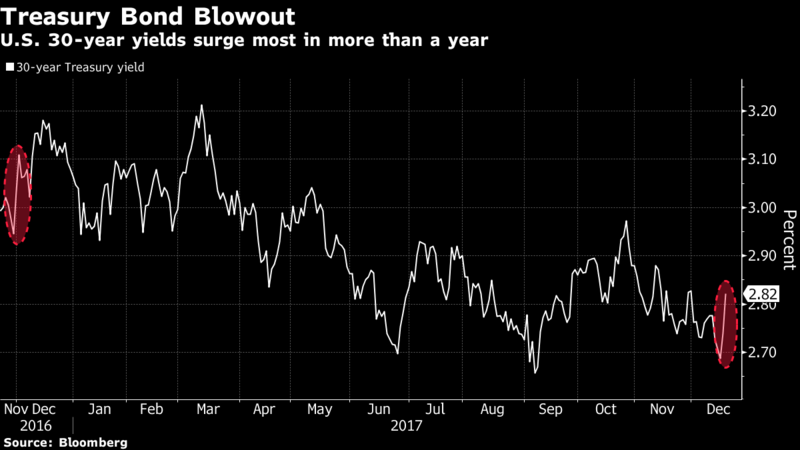 Someone bought 50,000 put options on bond futures at an average price of 1’04 ticks, according to a trader familiar with the transaction, wagering that the price of long-dated Treasuries would fall as 30-year yields increased. 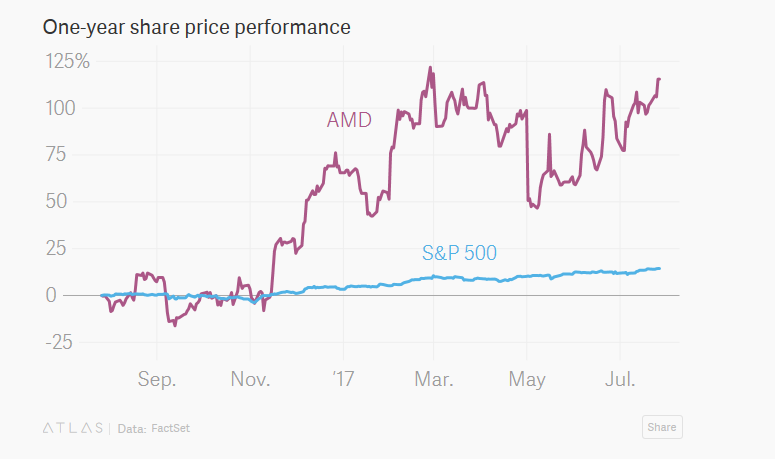 That price jumped to 2’21 ticks Tuesday amid a sustained climb in long-end yields to 2.82 percent, leaving the bet showing a profit of about $60 million. 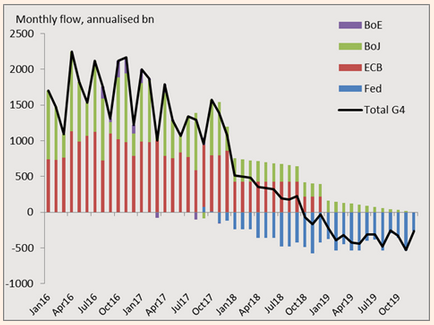 2.Central Banks are Getting Ready to Cut Back the Buying in 2018. The era of central bank bond buying that has sent prices of government and corporate debt soaring since the 2008-09 financial crisis is set to reach a turning point in 2018, after policymakers sketched out plans this year to rein in stimulus measures. 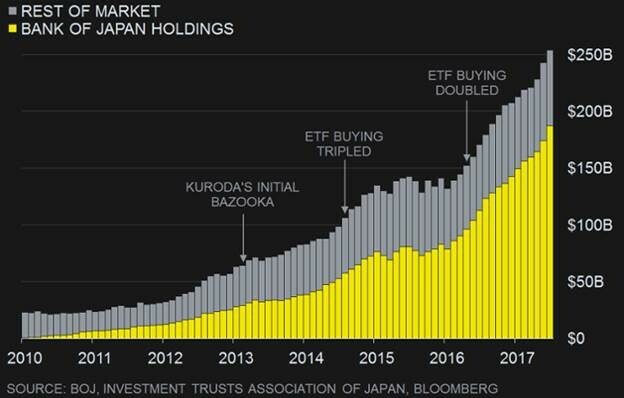 We get the BOJ Decision tonight – The BOJ will cut its buying target for domestic ETFs next year to 4 trillion ($35 billion) yen a year, down from 6 trillion yen, Bloomberg reports. Global manufacturing indexes have forged ahead to multi-year highs, in concert with improving economies rich with the tinder of easy monetary policy. In the U.S., a resurgence in corporate investment is driving equipment orders. Germany, where business sentiment is near a record, is helping engineer a pickup in Europe’s economy. 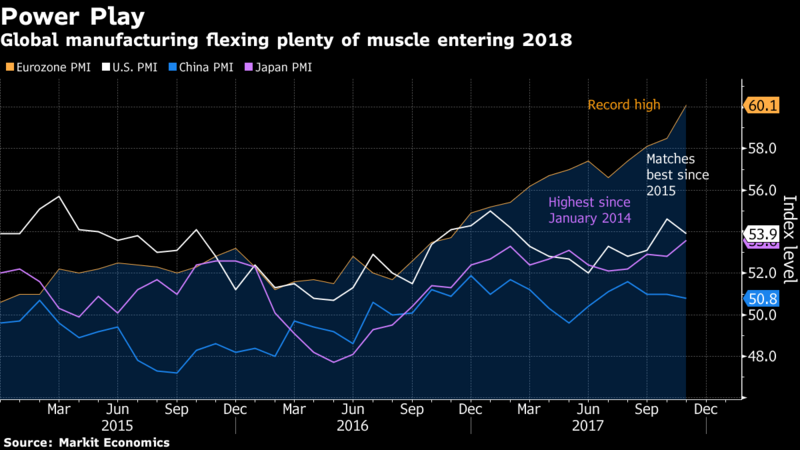 Combined with solid manufacturing in Japan, a measure of activity among producers in developed nations has muscled ahead to the highest level in nearly seven years. The collective strength in the biggest industrial economies is more than offsetting a stabilization in production at China’s factories. 4.European Manufacturers Have Done Well Despite 12% Rise in Euro. 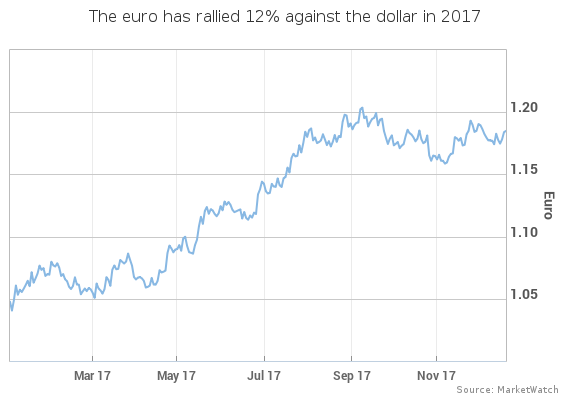 The euro EURUSD, +0.0168% is on track for a 12% gain against the dollar in 2017, defying forecasts a year ago that the shared currency would slump to parity with the greenback. If it ends 2017 around the current $1.18-level, it will have logged its best gain against the dollar since 2003, according to FactSet data. The euro strength is good for all the European tourists traveling overseas, but it hurts the region’s exporters as their products become more expensive for other currency holders. 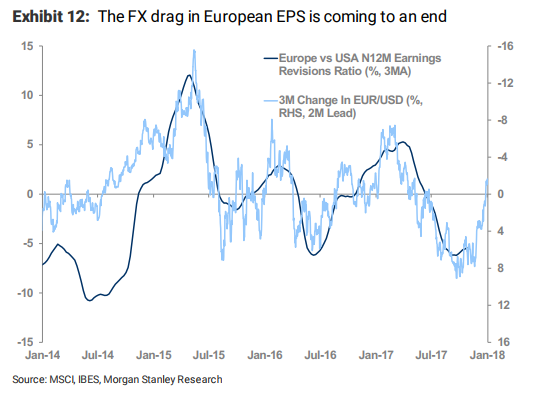 “The worst of the currency strength in terms of its impact on equities is now probably behind us rather than ahead of us,” said Graham Secker, head of European and U.K. equity strategy at Morgan Stanley. The Wall Street bank sees the euro topping out around $1.23 in the second quarter, before sliding to $1.17 at the end of 2018. J.P. Morgan also said the negative euro impact on earnings should moderate next year, even if it expects the currency to strengthen to $1.23 by the end of 2018. 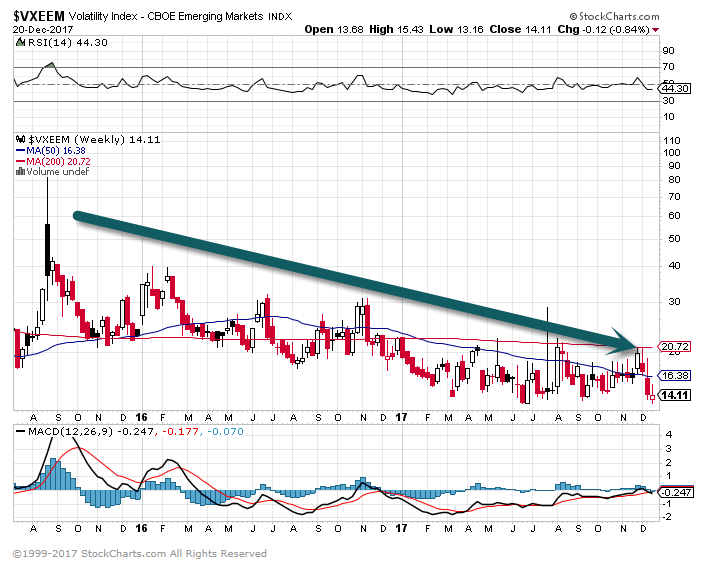 5.Emerging Market Volatility Makes New Lows. 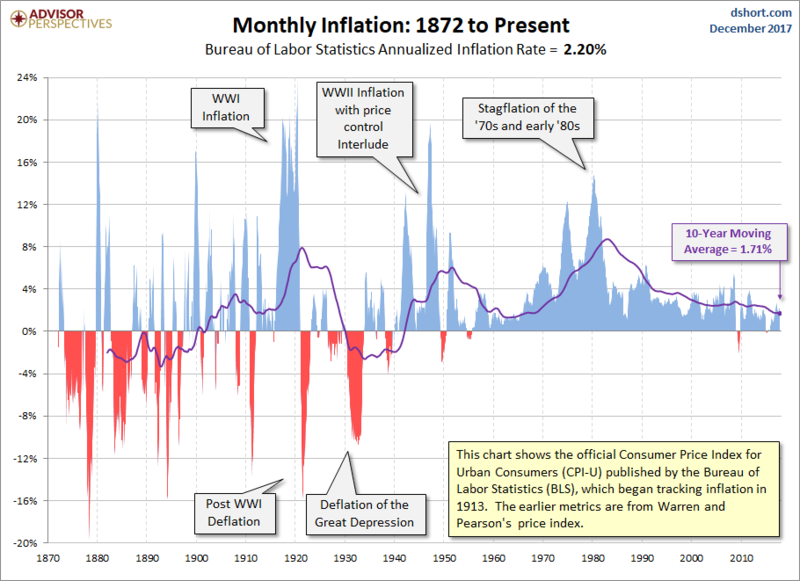 6.Most 2018 Predictions are Around…Will We Finally See Inflation? 7.The Tax Bill in One Chart. So for everyone who has not read the bill in full, here is a concise summary of the costs and benefits of the Republican tax legislation in one chart. 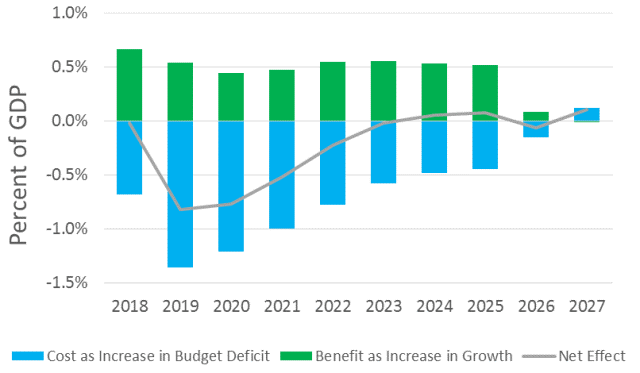 It compares the benefits of the tax bill, as measured in higher economic growth, as calculated by the Tax Policy Center, with the anticipated costs in higher budget deficits, as projected by the Congressional Budget Office (CBO). 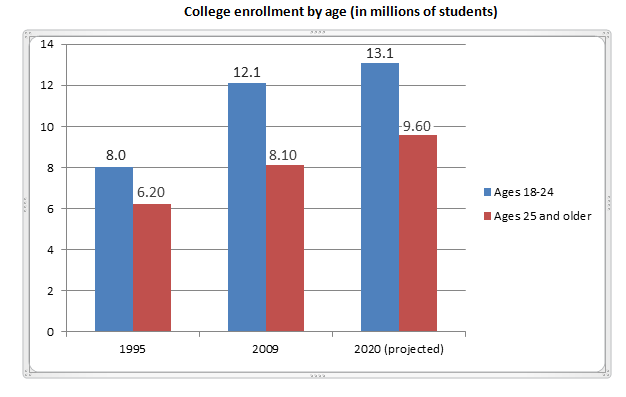 9.40% of College Undergrad Students are Under the Age of 24. What we know about people may surprise you. In the world of behavioral science, where I live, psychological researchers implement studies in an effort to better understand the nature of behavior. 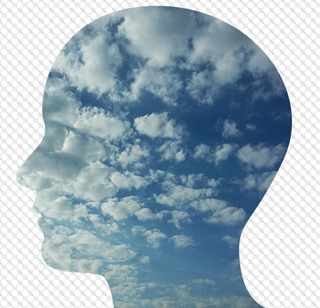 As a result of well-designed psychological research over the years, many novel findings with all kinds of implications have been documented by psychological researchers. Here is a list of 10 cool psychological research findings—findings that you might find surprising—findings that can help you better understand the people in your world. Note that this is in David Letterman Top-Ten-List format, to make it more fun! Human emotional expression shows extraordinary constancy across human populations (i.e., a smile is a smile wherever you go). In groundbreaking research on the nature of human emotional expression, Ekman and Friesen (1986) found that the facial expressions that correspond to such basic emotions as happiness, sadness, anger, surprise, disgust, and fear are remarkably similar across the world. From remote nomadic folks in the South Pacific to the fancy people sipping high-end tea on Park Avenue in Manhattan, the basics of how we express emotions are the same. You have more in common with a typical pigeon than you might realize. In some of the most important research ever done on the nature of behavior—across a storied career, B. F. Skinner (1953) made the case that the processes that underlie learning, such as operant and classical conditioning, are remarkably similar across species of animals—from dogs to goldfish to pigeons to rats to humans. The more you pay someone for doing a menial task, the less he or she will like it. In a classic set of studies on the concept of cognitive dissonance, Festinger and Carlsmith (1959) found that people who (a) engaged in menial tasks for no good apparent reason, (b) told another student that they liked the tasks, and were then (c) paid $1 for doing so reported liking the tasks much more than did participants who in the same study but who were paid $20 for their work. When people are poorly compensated for unpleasant work, they are more likely to convince themselves that they actually enjoyed the work so as to reduce their own levels of cognitive dissonance. Regular people (like you and I) are quite capable of obeying a stranger to the point of killing another human being. In a series of studies on the psychology of obedience to authority, Stanley Milgram documented, without question, that, under certain conditions, a large majority of normal adults are capable of killing someone else—especially if they are being directed to do so by some credible-seeming authority figure and if the context as framed as “for the good of science” (Milgram, 1963). Emotional intelligence often matters more than does cognitive intelligence when it comes to success in life. We place a premium on the importance of intelligence and on markers of academic aptitude. In fact, in several behavioral and life domains, based on a large body of research, success is better predicted by emotional intelligence than by cognitive intelligence (Mayer & Salovey, 1997). About ⅓ of homicides in North America today have something to do with infidelity. While we may think that humans are all civilized and have somehow emerged to be above our base evolutionary origins, it’s just not true! In an analysis of thousands of North American homicides, Daly and Wilson (1982) found that approximately ⅓ of homicides in recent North American history are best conceptualized as reactions to infidelity. People are more giving to others when the room smells nice. In a study on volunteerism, Liljenquist et al. (2010) had participants either (a) sit in a room that had not been cleaned recently or (b) sit in a room that was recently cleaned and sprayed with a nice-smelling spray cleaner. They were offered the opportunity to take literature for Habitat for Humanity. The participants in the nice-smelling room were more likely to take the literature and to report that they would volunteer for the organization. People’s reports of why they do what they do are often completely incorrect. In a description of a series of study, Nisbett and Wilson (1977) found that while people have no problem providing justifications for their actions, they are, quite often, actually totally unaware of the real causes of their behavior. For instance, participants who watched a movie that was accompanied by a constant loud noise from the hallway liked the movie much less than did participants who watched the same movie without the loud noise. When asked why they didn’t like the movie, not a single person in the loud-noise condition mentioned the loud noise. Personality barely shapes what we do. Research on the power of personality in predicting behavior has found that, on average, our personality traits tend to account for only about 9% of our behavior—at most (Mischel, 1968). We are not as helpful as we think we are! A large majority of seminar students connected with an Ivy League university who are slated to give a lecture on the story of the Good Samaritan in the Bible will step right over a person in need if they are running late to deliver the lecture (Darley & Batson, 1973). Think about that! If you know an armchair psychologist who thinks that he or she knows all the answers when it comes to people and that the work done by researchers in this field is a waste of time, you might want to forward this list to that person. 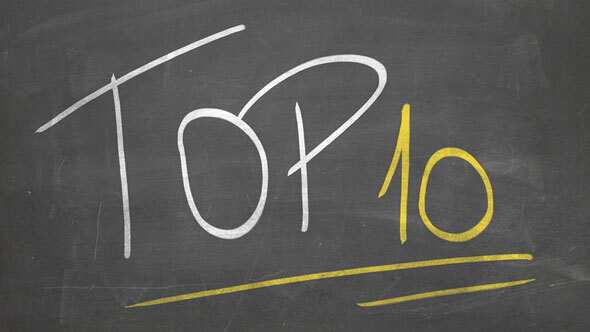 As demonstrated by this Top Ten List, psychological research is, well, really cool and it regularly leads to new and often-unexpected insights into what it means to be human.